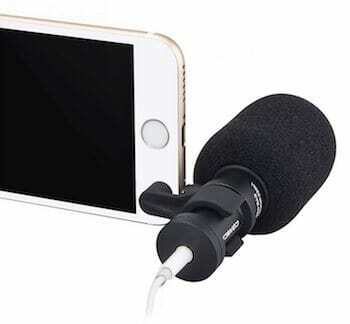 The iPhone audio is actually pretty decent for a phone, but if you are regularly recording interviews, YouTube videos or podcasts, you’ll definitely want to invest in an external iPhone microphone. You can also use these mics on-camera, or for recording music, meetings, and more. One tip: turn on Airplane Mode while recording or you will likely experience cellular feedback or distortion. We are going to focus on the best iPhone mics that use the lightning port as that is what Apple has used for the most recent iPhone and are likely to continue using, but you’ll also find a few that use the headphone jack. If you are looking for a lavalier mic that plugs into the headphone jack (or Lightning-to-headphone adapter), check out the first 3 recommendations in our best lavalier mics post. If you want wireless options, check out the wireless lav mics here. If you are looking for something to use with the Apple camera connection adapter, take a look at the best USB microphones post. 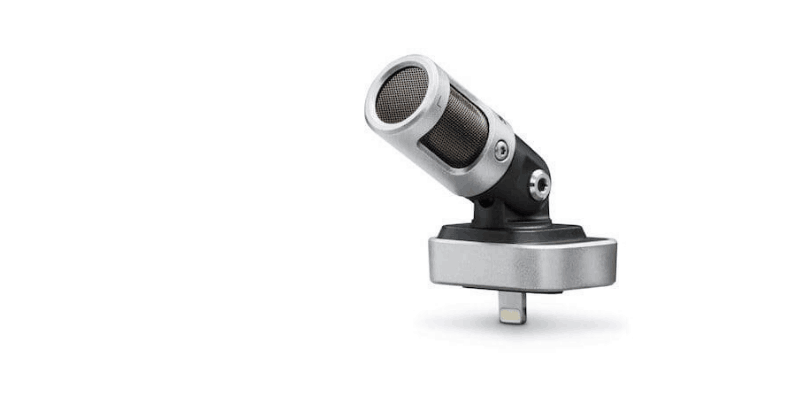 These external mics will also be compatible with an iPad or iPad Pro in addition to an iPhone as long as it has a lightning port, which Apple introduced with the iPhone 5. So if you have an iPhone 6, 6S, 7, 8, or X (10) all of these will work. The Shure MV88 is my top pick for an external iPhone mic. The build quality is extremely solid and made of all metal, it has both stereo and directional pickup. What really makes it the top choice is that it rotates and pivots, allowing you to position it very precisely. The free ShurePlus MOTIV app is impressive. The app allows you to record uncompressed audio (.wav), adjust the gain levels, change the stereo width, modify EQ settings, swap left & right and more. If you want to learn more about the app and microphone, check out our MV88 review. It also comes with a headphone adapter, carrying case and foam windscreen, although the Shure AMV88-FUR Rycote Windjammer will do a much better job if you’re using this outdoors. Update: In Jan 2019, Shure came out with the MV88+ Video Kit that comes with an upgraded microphone with USB-C and Lightning cables and a headphone jack, Manfrotto Pixi tripod, and phone mount. 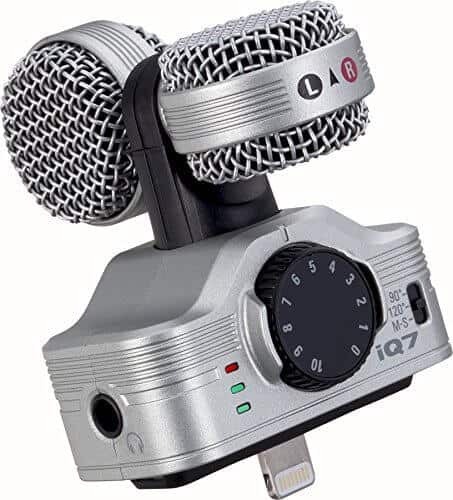 The Zoom iQ6 X/Y uses the same condenser microphones as the Zoom H4N Pro handheld audio recorder. It allows the range of pickup to adjust from 90 degrees to 120 degrees. The numbered wheel you see on the front is the mic gain setting, allow you to quickly make adjustments without going into software. 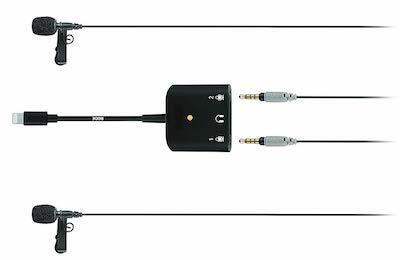 There is also a headphone/line-out jack that can be used during both recording and playback. This is great if you have a new iPhone 7 that doesn’t have a standard headphone jack anymore. One standout feature is the removable spacer – allowing you to use the Zoom iQ6 with or without an iPhone case. It has 3 LED’s to give you a visual signal of your levels. Zoom also has a recording iPhone app that allows you record .wav or .aac files. 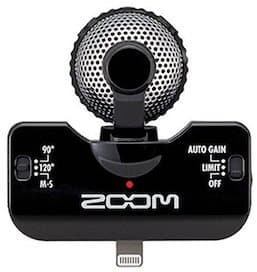 The Zoom iQ7 is similar to the above iQ6, but it uses a mid-side microphone configuration, giving you much more flexibility. One of the issues with X/Y recording is that you’re stuck with what is recorded. Mid-side recordings allow you to make adjustments in post-production. Mid-side is always mono-compatible as well. B&H has a great explanation of mid-side recording if you want to learn more. You can easily adjust between M-S, 120° stereo, and 90° stereo using the switch on the right. 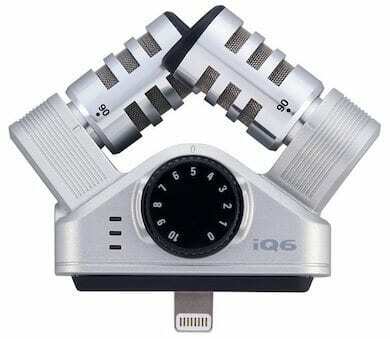 Like the iQ6, there is a hardware mic gain control front and center, and it also has a headphone/line-out combo jack. The microphone capsules can also rotate multiple directions to get them positioned properly for your subject or scene. Just announced and available at the end of August 2018, the Rode VideoMic Me-L is an updated Lightning version of the popular VideoMic Me. You can find that version in the 3.5mm headphone jack section farther down the page. It has a 3.5mm jack allowing you to plug headphones in to monitor your audio, a directional cardioid pickup pattern, and a 20Hz to 20kHz frequency range. Like the other version, this one also comes with a windscreen, which is always nice. Rode just came out with the Rode SC6-L Mobile Interview Kit. It comes with two smartLav+ mics, two windshields, two lapel clips, an adapter/breakout box, and a small carry pouch. Not only is this an excellent value, but it gives you the ability to record interviews anywhere you go. With the Rode Reporter App you can record separate tracks for each mic if needed, plus it has direct monitoring, gain control, and more. This is a really impressive little kit and highly recommended. It is possible you might want some additional cord length and Rode offers the SC1 20′ Extension Cable designed specifically for the smartLav+. 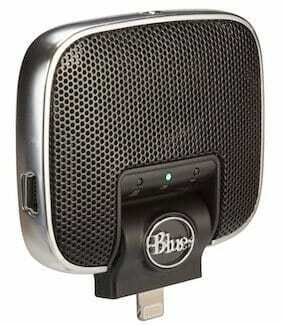 The Blue Raspberry is a desktop-style condenser microphone that includes a Lightning cable, as well as USB cable. There is a headphone jack with volume control for live monitoring and a 1/4″ thread so you can mount it to tripods. It’s designed to be plug-and-play but still give you excellent sound for anything from voice to instrument recordings. 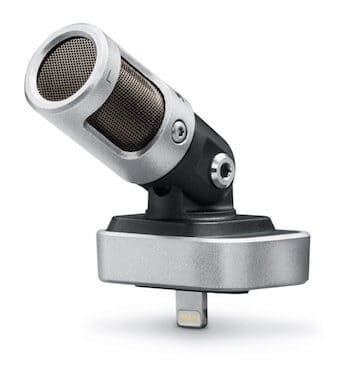 One option for a lavalier mic that is specifically designed for iPhone’s is the Sennheiser ClipMic. It uses the same omnidirectional microphone capsule as the Sennheiser ME2. The Lightning connection is Apple MFi Certified, and the analog audio signal is processed into digital 24 bit/96 kHz by hardware designed by Apogee (see the box-looking thing in the picture? That’s what that does). Comes with a carrying pouch and metal windscreen. This last one is actually a lightning to XLR converter! That means you can use nearly any professional microphone with an iPhone. The Rode i-XLR really makes your options endless – but you’ll need to travel with more gear – and likely larger gear. If you already have a great XLR microphone and want to add some portability while maintaining broadcast quality, this is your answer. While these microphones are designed to be used with smartphones, they can also be used with laptops if can make them fit as they use the same TRRS headphone jack. Look here if you want a lapel mic. 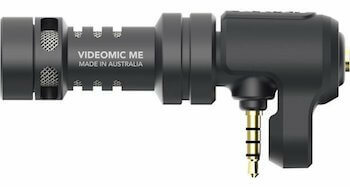 The Rode VideoMic Me is a nice compact mic that plugs into the headphone jack of pretty much any smartphone. It is compatible with both iPhones and Android-based phones. It includes a pass-through headphone jack so you can listen to your recordings without having to remove the microphone. The mount is also adjustable, allowing it to have a snug fit for any device. Rode also includes a furry windshield as well as a 2-year warranty when you register the mic. This is a great little mic for under $70. The Comica CVM-VS08 is a cardioid condenser shotgun mic that delivers excellent sound for a smartphone. Like the Rode above, you get a playthrough headphone jack for monitoring. To be clear, this is not “live” monitoring. The body is made of aluminum, making it lightweight, but very solid. Comica includes both a foam windshield and a furry windscreen. 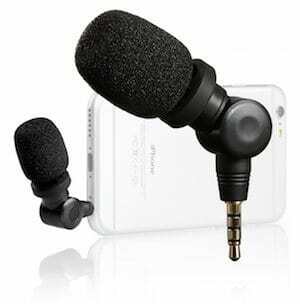 The clamp is removable, giving you the ability to rotate the microphone 360 degrees. Another option from Comica is the CVM-VM10. It includes both TRRS (smartphone) and TRS (camera) connections, as well as a shock mount. That allows you to easily switch between different devices. The downside here is that you will need something to mount the microphone to and you lose the additional headphone jack. 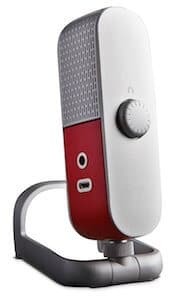 If you want something a little cheaper, the Saramonic SmartMic usually runs around $20. It has a plastic housing, but the microphone pivots and rotates in pretty much any direction. You’ll get better sound than what you would get from the built-in phone mic, but don’t expect professional quality from this one. Update: It appears that the IXY-L is compatible with the iPhone 5 and iPhone 6, with mixed results on the iPhone 7 and later. 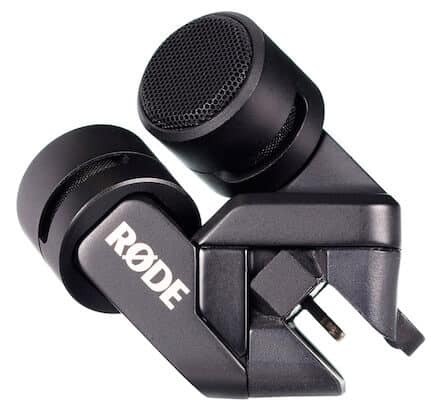 RØDE makes quality audio equipment and the Rode IXY-L is no different. Its all-metal casing makes it tough and protects the audio from electromagnetic interference. There is a matched pair of 1/2″ cardioid condenser microphones set up in an X-Y pattern with a frequency range from 20Hz – 20kHz. When used with the free Rode Rec App, you can record 24-bit audio, up to 96 kHz. There is also a 72Hz high-pass filter that can be turned on to reduce low-frequency sounds. One drawback with the app is that it doesn’t have gain control, but you can use other recording apps that allow you to control gain. Rode includes a protective zip case and windshield in the package. Update: They no longer seem to be selling the Zoom iQ5. I would go with the iQ7. The Zoom iQ5 is their entry-level “mid-side” iPhone mic. To me, it feels much cheaper than the iQ6 and iQ7 (above). I would recommend spending the extra $30 to get something with better build quality and will last. Plus, the other models come with removable spacers so you can use them with a case and the headphone jack doubles as a line out. The Blue Mikey has been discontinued. Blue recommends the Raspberry now, which includes a Lightning cable, but it’s more of a desktop microphone. It can handle audio as loud as 130dB (that’s loud!). There are two custom-designed condenser capsules with stereo pickup. It has auto-sensing technology to help stop distortion, along with a high-gain and low-gain setting. The Mikey’s shape and design are unique among other competing external iPhone microphones. It has a 230-degree swivel and LED indicator to let you know if you’re too loud. Frequency response ranges between 35Hz – 20kHz. Another great feature is the line level input, allowing you to record instruments as well. No matter which iPhone mic you choose, I highly recommend getting a quality smartphone tripod mount. It will give you more flexibility and better audio quality as you won’t have to worry about holding your phone in the same spot. If you want to record video as well (and who wouldn’t with an awesome new mic?!) you’ll definitely need a mount and tripod at the very least. The latest iPhone models have excellent cameras and you can get amazing video recordings with just a few extra pieces of gear – without needing to spend thousands on a DSLR camera and a shotgun mic. If you do want something a little more professional for video, take a look at these microphones for YouTube. Which model is your favorite? Is anything missing from our lineup? Let us know in the comments!